i can’t believe how long it’s been since i posted anything here! life’s been a little crazy lately – we had a major deadline at work last week and i ended up working 12 days straight! (and we shan’t say how many hours we were working in those days – it’s just too depressing.) so i’ve been a little behind. on blogging. on reading blogs. on knitting. on photographing my knitting. however, this doesn’t mean that absolutely no knitting happened – i still had my lunch breaks. 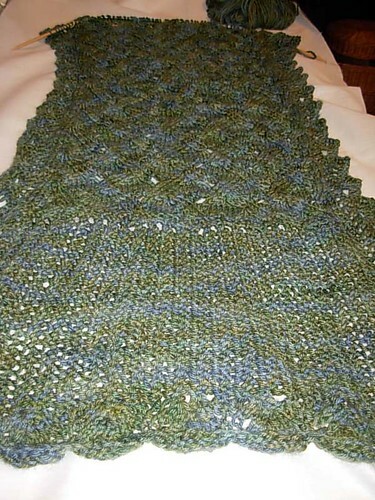 somehow, amazingly, i managed to get the first half of morning glory finished! 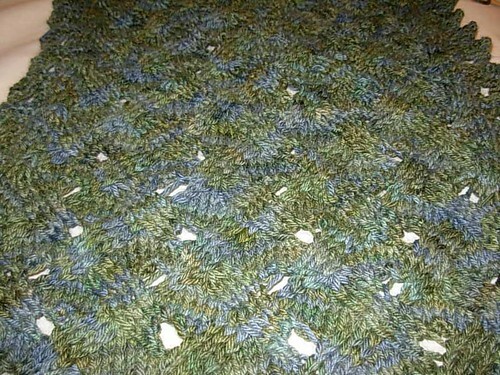 i can’t believe how fast it knits. the pattern (yo’s, decreases) is on both right- and wrong-side rows, so i thought it might get a little tricky or that i would be poor t.v. knitting, but it’s gone amazingly well. and the yarn, wistful, an alpaca-merino-silk blend, is an absolute dream to knit with. it is so unbelievably soft and smooth – i know i’m going to miss this project when it’s done. at least i still have a whole half left! among other miscellany – poking around other blogs, i realized i’ve neglected to mention that i’m on ravelry – as alittlefuzzy, of course. terribly dangerous, that place is, but oh-so-useful for the list-inclined. oooooh that is beautiful! Hope things have settled down for you now. I shall go and look for you on Ravelry.